No surprises in The Shire location bracket. 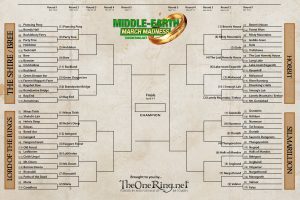 Bag End, Hobbiton and the Prancing Pony all won their bouts with 80% or more of the vote. Bree and Buckland were in the 70s for their victories (over Bywater and Crickhollow respectively). This staffer is especially pleased to report that the Green Dragon Inn is safely through; I am of course pulling for it to go all the way to ultimate victory! Bucklebury Ferry is out, conquered by the Party Tree, with the voting split two thirds to one third; and Samwise will be sad to know that Bagshot Row is also gone, as it was unable to stand up to the Brandywine Bridge. 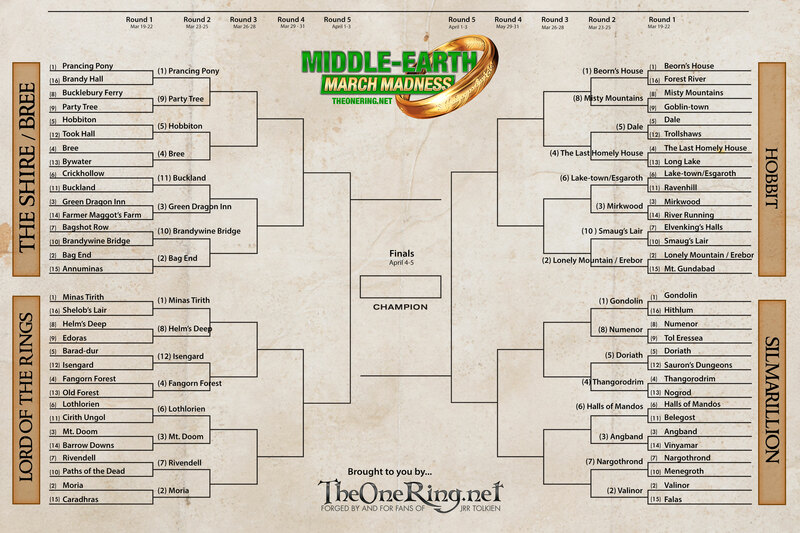 Perhaps the toughest fight in Round 1 of this bracket was Helm’s Deep vs Edoras. How to choose between those two?? In the end, it was Rohan’s stronghold which won the day, knocking out the Golden Hall, but with a margin of only 10%. On to Hobbit locations, where the Lonely Mountain, Lake-town, Mirkwood, Dale, Beorn’s House, the Last Homely House and the Misty Mountains were all triumphant without really being put to the test. The only close battle in this category was between Smaug’s Lair and the Elvenking’s Halls. Thranduil is going home after just one round; the fire drake conquered in the end, though the margin was in single digits. And now Smaug’s Lair has to take on Erebor in Round 2; a conflict of interest, surely?! So on to the second round! Will Hobbiton beat Bree? What will happen when Minas Tirith takes on Helm’s Deep? Can Gondolin defeat Numenor? And most importantly, is the Green Dragon on the way to the final prize? (Fingers crossed; no journalistic impartiality here!) YOU decide! Voting in Round 2 closes at 10pm EST on Monday 25 March, so don’t delay: VOTE NOW!